Middlesbrough winger Stewart Downing apologised to fans who travelled to see the 4-0 defeat at Bournemouth that pushed Boro closer to relegation. They were 2-0 down after 16 minutes and played for 70 minutes with 10 men after Gaston Ramirez was sent off. The Teessiders are nine points off safety with five matches left and could be relegated as early as next Sunday. "We can only blame ourselves and nobody else. It's hard to take," said former England player Downing. "Sorry to the fans, they've travelled a long way. They've been first class all season." Boro had started the day six points from safety, knowing victory at the Vitality Stadium would leave them with a fighting chance of staying up. However, fellow strugglers Swansea and Hull both won to leave Middlesbrough in grave danger of returning to the Championship a year after winning promotion. Boro are without a league win in 16 attempts and have scored only 23 goals in 33 matches. Indeed, Bournemouth striker Joshua King has scored five goals more than Middlesbrough in the Premier League in 2017. They conceded after just 96 seconds at Bournemouth, leaving head coach Steve Agnew to accuse his side of "naive defending". "In a way, we lost the game in the first 10 minutes. That's not like us - it was really poor defending. Playing short passes on the edge of the area is why we've been conceding. "It was naive defending. We made mistakes, got punished and it made it a very difficult afternoon. There's angry and disappointed players in there but we'll all be in tomorrow morning and address the situation." Former Liverpool and Wales striker Dean Saunders on Final Score: "Middlesbrough, at the start of the season, would have been happy to finish the season fourth from bottom. "But their tactic from the first game was counter-attacking, and if you barely create chances in multiple matches your forwards lose confidence. That then resulted in [sacked manager] Aitor Karanka trying to change tactics, and they have never settled on a successful formula." Swansea are two points from safety with four games left after a 2-0 win over Stoke ended a three-match losing run. Swans boss Paul Clement admitted he had one ear on the match involving relegation rivals Hull, who beat Watford 2-0. "I knew at half-time it was 0-0 at Hull and they were down to 10 men. It is a terrific result for them," he added. "I did feel it would be a game they would win. We have to concentrate on our jobs. "Hull are in the driving seat but we will chase them down until the last moment. Nothing changed between us and Hull but what has changed is we have got momentum now." Hull have a two-point cushion over their chasers with four games to go following a gutsy 2-0 win over Watford - despite playing 65 minutes with 10 men. Although the Tigers have now won 19 points out of a possible 21 at home under Marco Silva, the Portuguese boss has yet to win away from home. "I want too much to win away because it's really important," said Silva. "It was a really important win. I'm really happy when our club fighting the way we have and we will continue to fight to keep our club in the Premier League." 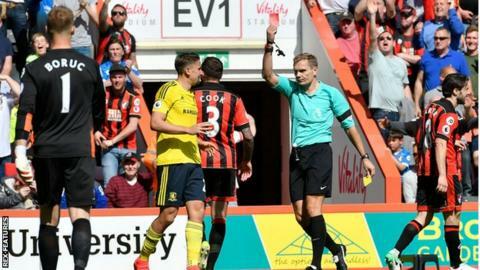 Bournemouth went into their home game with Middlesbrough on the back of a four-match winless run, raising fears they could be dragged into the battle for survival. Yet Eddie Howe's men moved four places up the table to 12th, seven points above the relegation zone with four games to play, after a comprehensive win. Only a disastrous finish will prevent the Cherries from playing in the top flight for a third successive season. "We've still got more points to get but we're looking upwards to see where we can finish," said Howe. "We've always said we want to surpass last season's total of 42 points and we're closing in on that [they now have 38]. If we can play as we did today, we'll be fine." Former Liverpool and Wales striker Dean Saunders on Final Score: "Credit to Bournemouth, because for some clubs who are all but safe at this stage of the season it's tempting to put the sunglasses on. Bournemouth haven't." Bottom club Sunderland did not play on Saturday but they are 12 points off safety with six matches remaining and could be relegated next weekend. They face local rivals and fellow relegation candidates Middlesbrough on Wednesday and may finally be put out of their misery by Bournemouth next Saturday. Even if the Black Cats do manage to avoid the drop for another week or so, their last two games of the season are away to Arsenal and Chelsea respectively on 16 and 21 May.